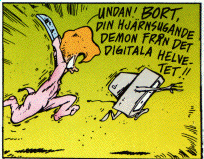 Ibland är det här en bild från min webbkamera. Just nu blir det Opus istället. This is the personal homepage of Stefan Nyström, a computer and music nerd living in Lund, Sweden. Welcome. Sure, we all know that Google Toolbar is the greatest thing since sliced bread, but I like to do it like we did in the olden days: my own search boxes. Makes me feel all warm and fuzzy inside. consequently entitled to use the Duck logo. A wise man once said "publishing lists of record and tape collections evokes images of lonely, pathetic men who talk incessantly about their cats". Yes, that just about sums it up. Anyway, these are the last couple of records I've bought. Enjoyable and accessible Wagner in Den Flygande Holländaren at Malmö Opera. Short vacation at Alunbrukets B&B, good fika at Tastecelebration Residence, pleasant hike to Hallamölla, very good food at Talldungens Gårdshotell. Friendly game FCR - LB07 in biting cold. Season premiere of Allsvenskan, questionable result and a missed penalty in MFF - Häcken, 1-0. Quality time with the people from Chiswick. Potential turnaround of a lousy start to the season? MFF - Östersund, 2-0. Shazam! (2019). Silly but fun! Händel's Tidens och Insiktens triumf at Malmö Opera. Fun to see a baroque opera. First half better than the second, but soloists and the orchestra were great throughout. First home game of the season for FCR against Kristianstad. Comfortable 5-1 in the sun. when we should be trying to find some on earth?" If this is your first visit since Tuesday, April 23 11:49 this page is problably new to you. At least in some small, insignificant detail.